TerraBound Solutions offers an array of high-quality, durable, safe bleachers and grandstands for your group seating needs! 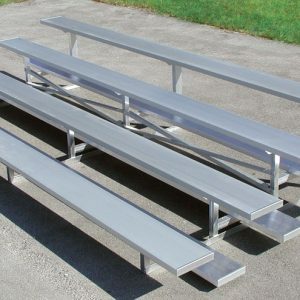 Our bleacher systems include aluminum bleachers, portable bleachers and sports bleachers in tip n’ roll style, non elevated and elevated bleacher style. 9' Seat Length 23"H x 36"D x 9' 12 73 lbs. 15' Seat Length 23"H x 36"D x 15' 20 116 lbs. 21' Seat Length 23"H x 36"D x 21' 28 161 lbs. 27' Seat Length 23"H x 36"D x 27' 36 206 lbs. 7 1/2' Seat Length 30"H x 60"D x 7' 6" 15 109 lbs. 9' Seat Length 30"H x 60"D x 9' 24 123 lbs. 15' Seat Length 30"H x 60"D x 15' 36 200 lbs. 21' Seat Length 30"H x 60"D x 21' 42 278 lbs. 27' Seat Length 30"H x 60"D x 27' 54 388 lbs. 7 1/2' Seat Length 30"H x 60"D x 7' 6" 20 170 lbs. 9' Seat Length 37"H x 84"D x 9' 28 178 lbs. 15' Seat Length 37"H x 84"D x 15' 40 278 lbs. 21' Seat Length 37"H x 84"D x 21' 56 412 lbs. 27' Seat Length 37"H x 84"D x 27' 82 526 lbs. 9' Seat Length 44"H x 108"D x 9' 30 251 lbs. 15' Seat Length 44"H x 108"D x 15' 50 408 lbs. 21' Seat Length 44"H x 108"D x 21' 70 524 lbs. 27' Seat Length 44"H x 108"D x 27' 90 670 lbs. 15' Seat Length 110"H x 186"D x 15' 80 1,199 lbs. 21' Seat Length 110"H x 186"D x 21' 112 1,574 lbs. 27' Seat Length 110"H x 186"D x 27' 144 1,819 lbs. 15' Seat Length 124"H x 234"D x 15' 100 1,569 lbs. 21' Seat Length 124"H x 234"D x 21' 140 2,036 lbs. 27' Seat Length 124"H x 234"D x 27' 180 2,693 lbs. Bleachers pictured on this page contain additional Double Footboards and Middle Aisle with Handrail. 15' Seat Length 186"H x 351"D x 15' 150 2,784 lbs. 21' Seat Length 186"H x 351"D x 21' 210 3,700 lbs. 27' Seat Length 186"H x 351"D x 27' 270 4,627 lbs. 3 Row 7 1/2'L 5'D x 7' 5"L 15 109 lbs. 3 Row 9'L 5'D x 9'L 24 123 lbs. 3 Row 15'L 5'D x 15'L 36 195 lbs. 3 Row 21'L 5'D x 21'L 42 271 lbs. 3 Row 27'L 5'D x 27'L 54 347 lbs. 4 Row 7 1/2'L 7'D x 30"H x 7' 5"L 20 155 lbs. 4 Row 9'L 7'D x 30"H x 9'L 28 170 lbs. 4 Row 15'L 7'D x 30"H x 15'L 40 270 lbs. 4 Row 21'L 7'D x 30"H x 21'L 56 374 lbs. 4 Row 27'L 7'D x 30"H x 27'L 82 478 lbs. 3 Row 7 1/2'L 2'H x 4' 11 5/8"D 15 105 lbs. 3 Row 9'L 2'H x 4' 11 5/8"D 20 165 lbs. 3 Row 15'L 2'H x 4' 11 5/8"D 30 213 lbs. 3 Row 21'L 2'H x 4' 11 5/8" D 41 296 lbs. 3 Row 27'L 2'H x 4' 11 5/8" D 54 388 lbs. 4 Row 7 1/2'L 2' 6"H x 6' 11 5/8" D 20 295 lbs. 4 Row 15'L 2' 6"H x 6' 11 5/8" D 40 327 lbs. 4 Row 21'L 2' 6"H x 6' 11 5/8" D 56 408 lbs. 4 Row 27'L 2' 6"H x 6' 11 5/8" D 72 522 lbs. 2 Row 7 1/2'L 23"H x 36"D 8 75 lbs. 2 Row 9'L 23"H x 36"D 12 81 lbs. 2 Row 15'L 23"H x 36"D 20 188 lbs. 2 Row 21'L 23"H x 36"D 28 181 lbs. 3 Row 7 1/2'L 30"H x 60"D 15 119 lbs. 3 Row 9'L 30"H x 60"D 24 132 lbs. 3 Row 15'L 30"H x 60"D 36 213 lbs. 3 Row 21'L 30"H x 60"D 42 298 lbs. 3 Row 24'L 30"H x 60"D 48 355 lbs. 4 Row 7 1/2'L 38"H x 81"D 28 181 lbs. 4 Row 15'L 38"H x 81"D 40 282 lbs. 4 Row 21'L 38"H x 81"D 56 407 lbs. 5 Row 9'L 48"H x 105"D 30 243 lbs. 5 Row 15'L 48"H x 105"D 50 391 lbs. 5 Row 21'L 48"H x 105"D 70 546 lbs. 4 Row 19'L 11' 8"D x 19'W 42 1,585 lbs. 4 Row 25'L 11' 8"D x 25'W 58 2,244 lbs. 4 Row 32'L 11' 8"D x 31'W 74 2,772 lbs. 8 Row 19'L 23' 8"D x 19'W 82 3,168 lbs. 8 Row 25'L 23' 8"D x 25'W 114 4,200 lbs. 8 Row 31'L 23' 8"D x 31'W 146 4,855 lbs. 3 Row 21'L 6' 6"D x 21'W 42 970 lbs. 3 Row 27'L 6' 6"D x 27'W 54 1,300 lbs. 3 Row 33'L 6' 6"D x 33'W 66 1,525 lbs. 5 Row 21'L 11' 6"D x 21'W 50 1,300 lbs. 5 Row 27'L 11' 6"D x 27'W 90 1,800 lbs. 5 Row 33'L 11' 6"D x 33'W 110 3,200 lbs. Each grandstand structure is custom-designed for each individual location to guarantee correct sizing and compliance with local building codes.Please call and speak with a sales representative to have a system designed for your needs. 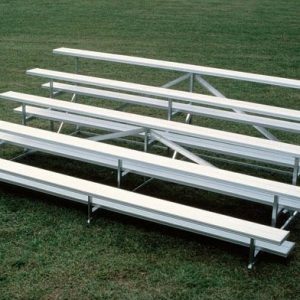 We understand there are three primary bleacher components buyers consider when making a purchase: the bleachers’ capacity, whether the bleachers are permanent/stationary or portable/movable, and special features. 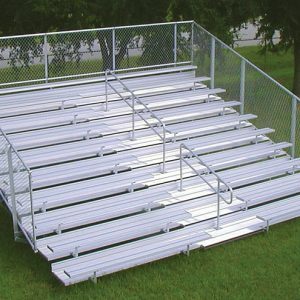 Aluminum bleachers have been a staple of ballparks, football fields, race tracks, and countless other venues for decades. They’re nearly as common of a sight at a sports field as a scoreboard. 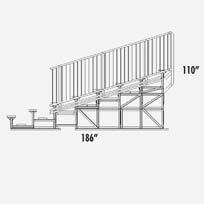 Each level of seat is reached by climbing up the bleachers stair-like design, alternating from floorboard to seat, floorboard to seat as you move up the bleacher. 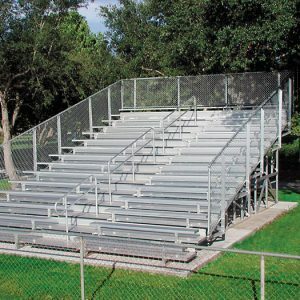 When the time comes to upgrade or replace these systems it can seem like a daunting task given the sheer variety of bleacher setups are out there. Gone are the days of splintery wooden stadium bleachers, and whether fans and patrons are seated in no-rise low-rise, portable, aluminum, retractable or plastic varieties.